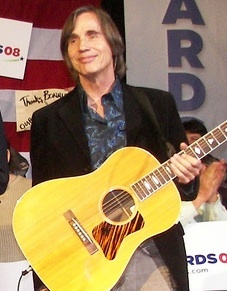 Jackson Browne - Wikipedia, entziklopedia askea. Jackson Browne, jaiotza-izenaz Clyde Jackson Browne (Heidelberg, Alemania, 1948 -), Alemanian jaiotako abeslari estatubatuarra da. Hainbat talderentzako abestiak egin zituen 1960ko hamarraldian: The Byrds, Velvet Underground, The Eagles. 1978an egin zen ospetsu, Running on empty diskoari eta, bereziki, Stay kantuari esker. Gerora, Hold out (1980), Lives in the balance (1986), World in Motion (1989), I'm Alive (1993) Looking East (1996), The Naked Ride Home (2002) eta Time the Conqueror (2008) lanak argitaratu ditu. Orriaren azken aldaketa: 23 otsaila 2019, 14:17.